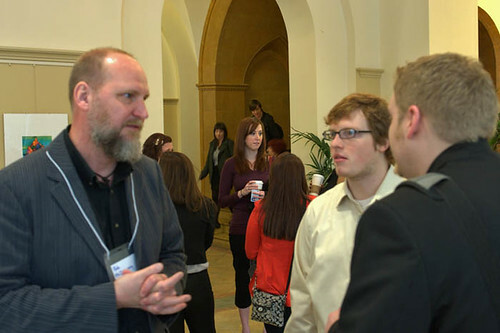 Point Park students had the unique opportunity to attend a national psychology conference held right on their campus this 2012 spring semester. Approximately 200 professionals, scholars, and faculty came to Point Park University for the Fifth Annual Conference of the Society for Humanistic Psychology. This year's conference was titled "Person, Consciousness and Community," and focused on the theoretical and practical applications of considering the person in the context of community. "It was quite wonderful to co-chair with Dr. Robbins the 5th Annual Conference of The Society for Humanistic Psychology because with this particular conference we consciously created a community that both reflected Point Park University's values regarding civic responsibility and recognition of diversity as well as APA, Division 32's ongoing interest in better welcoming people and ideas that challenge and potentially facilitate our values and practices," remarked Robert McInerney, Ph.D., Point Park assistant professor of psychology. Keynote speakers at the conference were psychology scholars Isaac Prilleltensky, Ph.D., Constance Fischer, Ph.D., and Robert Stolorow, Ph.D.David Elkins, Ph.D., president of the Society for Humanistic Psychology, Division 32, and professor emeritus of psychology in the Graduate School of Education and Psychology at Pepperdine University delivered the opening remarks. He said that the society, which is a division of the American Psychological Association, represents the "humanistic voice of psychology" and is "a strong supporter of social justice." Also at the conference, a select number of Point Park psychology students presented their own empirical research at a poster session. For example, senior psychology major Alyssa Adamo presented a study of authentic religious faith and religious experience which covered participants' personal experiences with the live phenomena of religion and how it is incorporated within their lives. "Having such a large-scale conference allowed Point Park to showcase its talent and also provided the students with a unique opportunity to see and interact with the greater community of humanistic psychology," said Adamo. All symposiums emphasized the theme of community and the importance of healing relationships in the lives of individuals and in therapeutic environments. There were a variety of topics addressed such as "How and Why To Treat Patients Without Psychiatric Drugs," and "Celebrating the Women of Humanistic Psychology." Point Park psychology professors Sharna Olfman, Ph.D., and Brent Robbins, Ph.D., along with Jim Gottstein and Tony Stanton, M.D., held a symposium based on their book "Drugging Our Children: How Profiteers are Pushing Antipsychotics on our Youngest, and What We Can Do to Stop it."